The Game, Tumblr, and Twitter: temmie)@tuyoki.2h yee!! 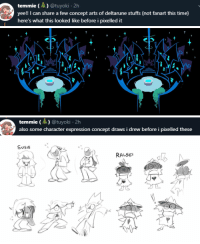 I can share a few concept arts of deltarune stuffs (not fanart this time) here's what this looked like before i pixelled it temmie (A) @tuyoki 2h also some character expression concept draws i drew before i pixelled these SUSIE ° 0 RALSE al 0 nochocolate:Temmie Chang shared a few concept arts from the game: Ralsei’s home and character expressions. nochocolate:Temmie Chang shared a few concept arts from the game: Ralsei’s home and character expressions.